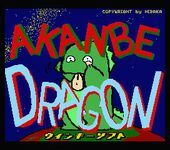 Akanbe Dragon for MSX2 is a weird blend of strategy and action game, where you control a group of dinossurs and have to beat another group of animals, controlled by the computer (in the first level, for example, it's a group of jungle animals like monkeys and zebras). In the strategy part of the game, the two groups are set in a chessboard-like square grid, with different type of terrains (woods, plains, lakes). In these phase, each dinosaur/animal has a different kind of movemente, just like chess pieces. When two opposite animals encounter, the action phase begins. Now one animal must kill the other. Each animal/dinosaur has different stats for life, power, speed, etc. You mainly shoot and try to hit your opponent, while avoiding his shots. Depending on the terrain (woods, lake) a different scenario and fight conditions are set. The game has also a levl editor, where you can build your own set of pieces and terrains.